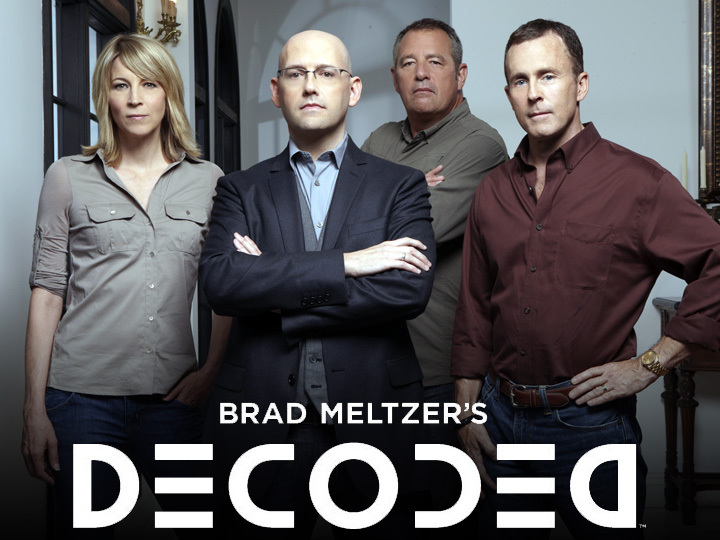 Since June, I have been working as a Producer for a new History Channel series called Brad Meltzer’s DECODED. The show features a team of investigators — the “Decoders” — solving mysteries from throughout American History. Bestselling author Brad Meltzer is the host, and kind of the Charlie figure to this Charlie’s Angels. John Wilkes Booth: Did John Wilkes really die two weeks after assassinating Lincoln, or did he survive for another 40 years under assumed identities around the world? Was the man killed in Garrett’s Barn a patsy? Rebel Gold: Where did the missing Confederate treasury disappear to after it was raided by night time raiders in Georgia in 1865? D.B. Cooper The only unsolved skyjacking case in American History. Who was this famous airline hijacker, and did he survive his 1971 jump from the back of a Boeing 727 with $200,000 in cash? The White House Cornerstone: The very first piece of the White House was laid in 1792 in a secret Freemason ceremony, and it has since disappeared. What happened to the cornerstone, and did the Freemasons have something to do with it? All in all, it is a really fun job, even if though it’s a lot of work. The series is set to premiere on December 2nd on the History Channel, so be sure to tune in! DECODED is produced by Go Go Luckey Entertainment. Reality Rush, LLC officially launches! Is the D.B. Cooper case solved?